Chances are you’ve read this hackneyd question before, paused to consider it a few moments, then dismissed it never to think of it again. The distinction is more subtle than you might think. While the personal development industry and most modern media companies (read listicle creation boiler room) has probably churned out more than a few thoughts on these roles, I’ve come to some personal epiphanies that I haven’t seen elsewhere, and that I hope they will help you too. Consumption (noun): 1. the using up of a resource. And the resource here is your time. 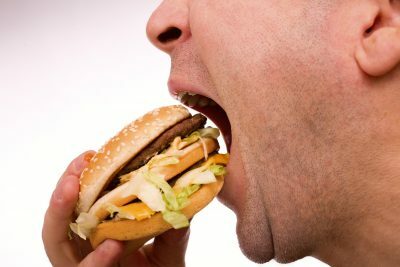 Each time you open your mouth and shove food inside it you are consuming. Each time you choose your favorite flavor of streaming service, turn on the television/radio, open your favorite social app and begin scrolling its infinite list of algorithmically derived stories you are consuming. Each time you read an article via web browser (including this one), mindlessly surf the Internet, fire up your favorite link aggregator (Reddit, hacker news etc) you are consuming. You’re even consuming when you read a book… listen to a podcast, audio book, or music. Consumption is modern day’s Soma. And I’ll posit that it has destroyed more people’s dreams than any other force in history. Worse than heroin. Worse than meth. Worse than opium. Really. Wait, I suppose you’re going to tell me that all consumption is bad. How is reading a book or listening to a podcast on my morning commute a bad use of my time? Don’t put words in my mouth! Without the majority of people spending the majority of time consuming — you’d find it hard to be a producer. Some consumption is inherent to survival. And not ALL consumption is bad obviously, but I want to alert you to how common consumption really is… and how often we practice the act without realizing it. The first step in being able to change something is being aware of its existence. And as we’ll see, shifting your thinking by asking a simple question, “Right now, am I producing or consuming?” can be very helpful. David Parkinson’s First Law of Consumption: Consumption is our societal default. An illustrative example: During Christmas dinner last year I came to realize that most of the conversation centered around consumption. I realize I’m cherry picking a bit here (it WAS Christmas after all) and of course you would expect some of to discussion to center around the coveted items that had magically appeared into people’s lives earlier in the day. In one case, a very adorable small person received an American Girl Doll. Immediately, everyone wanted to share personal stories about their particular doll, American Girl variety or otherwise. Somehow there was a transition to blindingly hot sauces and where they could be obtained… and that led to a debate about where the best spicy tacos are in town. Next, a couple was going on vacation to Florida and wanted to talk about it. Our group listened intently. To most people this looked like a normal conversation, but in my mind it was centered around people discussing the consumption of various products and services. Is this nothing more than the human experience? The American experience? People sharing a common unifying characteristic? Sure! But I asked myself, what did all these seemingly disparate topics have in common? Consumption. It’s the common thread. Again, I’m not saying that consumption is a bad thing! There’s nothing wrong with being a kid, getting a doll, tacos, or going on vacation. But I realized in that moment, that so much of the our experience is hinged around consumption. David Parkinson’s Second Law of Consumption: Most people start their day with consumption… but you don’t have to. Illustrative Example: Every morning, my Philips GoLite blasts 200 lux of piercing blue light at my blearing eyes. NPR News would helpfully recount the daily news. And until recently, my morning ritual consisted of rolling over and checking my phone. I’d fire up my RSS reader and read some of my favorite feeds, then scroll through Instagram as I reminisced when I saw photos from friends and places I remember fondly. Then I’d scroll Twitter for a bit. And before I knew what was happening, I just lost 30 minutes of my life to consumption (182 hours a year). Consumption is the vampire of time. Don’t believe me? 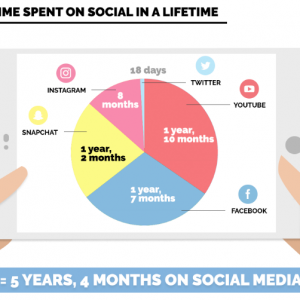 Look how much time the average social media user uses over their lifetime. Hint: 5 years, 4 months of continual 24×7 use! This is why I’ve uninstalled Instagram and Facebook from my phone. When I unplugged my phone from its charger, I was essentially plugging into the online world. An infinite sea of voices clamored for attention. They wanted me to listen to what they had to say because attention is the new coin of the realm. Instead of producing my own ideas and thoughts, beliefs, and reality… I’m essentially plugging into the matrix of consumption. What can you do instead: Make yourself the focus of your mornings. Do 20 push-ups. Roll your abs with an ab roller. Do your StrongLifts workout. Try morning pages. Try a morning success ritual. Whatever works for you… but for God’s sake, don’t passively consume content. David Parkinson’s Third Law of Consumption: Consumption: Beware the slow killer in life. Physical pain is immediate and it damn well better be otherwise we’d be more like dogs than humans (punishing dogs is pointless unless you can catch them in the midst of an undesirable activity)…. but consumption isn’t like that at all. It’s choosing one marshmallow now as opposed to two later. Its symptoms are regret. It is a destroyer of dreams because unproductive consumption today limits your potential future. 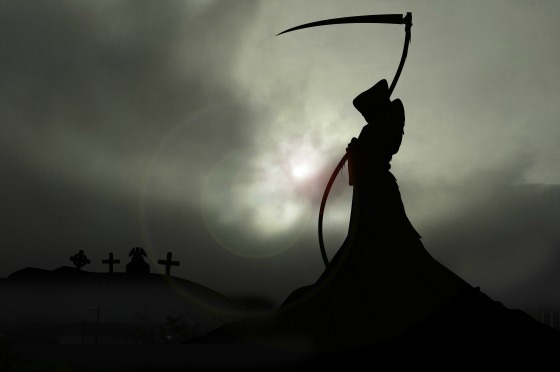 Consumption doesn’t kill quickly — that would be too obvious. 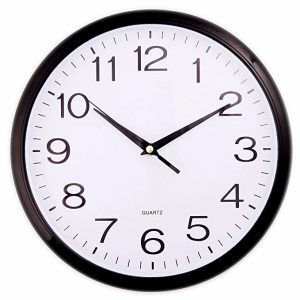 You don’t notice a day at a time sneaking past you until they have added up to a lump of time you can comprehend. One day, one week, one month, one year, a decade, even a lifetime. Bonus: You can also try to make your typical consumption patterns less enjoyable. For instance I used to check Facebook when I was bored and in need of a dopamine rush. Most of what makes Facebook Facebook is their “News Feed” — algorithmically optimized stories from your social network. To start out with, I found block Facebook too difficult, so I installed Facebook News Eradicator — a chrome extension that eliminates your News Feed. I can still use Facebook — but now I have to have a targeted objective instead of mindlessly scrolling an infinite list of stories. Having destroyed the main reason why I visited Facebook, I now find myself doing it much less often. Great! David Parkinson’s Fourth Law of Consumption: Some types of consumption are better than others. David Parkinson’s Fifth Law of Consumption: Some consumption is absolutely necessary. But start tracking your time, and limit the worst offenders. For me I realized that I was consuming too much… and would like to focus on producing more. And producing more than I consume. But I first had to see the scope of the problem. I use Taskwarrior / Timewarrior, to manage and review my time. Whatever you see fit to use is great. You can start asking yourself the question of “what am I really spending time on?” and “Should I be spending this much time on activity X?”. These are questions you cannot hope to answer until you begin diligently tracking your time. Fun fact: I had the idea for this article 9 months ago. But then I wasn’t sure where I’d put my writing online, then I didn’t like the way this website used to look, etc etc etc. Focus on what matters. And if you succeed in just getting your ideas/product/vision/music/project out there, you’re ahead of 90% of people. David Parkinson’s Sixth Law of Consumption: pick a day to consume and enjoy it! Even God needed a day for rest. You probably do too. Pick one day to rest and don’t schedule any activities. Enjoy & thank me later.